CARNATION is a prominent manufacturer of Ductile & Grey Cast Iron components viz, Gear Box Housing, Clutch Housing, Trumpet Housing, King Post Machine, Carriage Casting, Hydra Clamp Housing, Carrier LHS & RHS, Stub Axle Hub, Intermediate Flange Brackets, Drive Housings, Piston Hydraulics, Cylinder Hydraulics, Bracket Hydraulics etc. with annual capacity of 12000 MT. It specializes in Automotive, Agriculture, Railway, Earth Moving Equipments, Composer for Refrigeration, Textile and Marine Industries. The efficient and experienced technical team of the company is dedicated to meet the international/ national quality standards and the stringent customer requirements with an optimum production lead time. The company has proven its efficiency by submitting sample casting in 45 days. 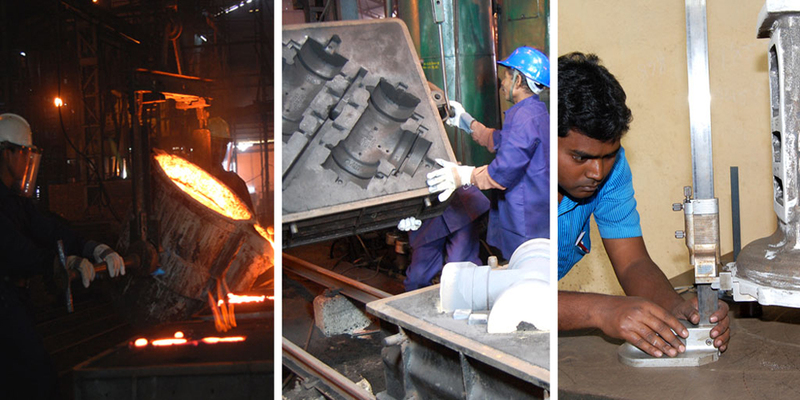 The promoters of the company have vast experience of more than 4 decades in Ferrous and Non Ferrous Metal industry. The plant is located very near the sea port of Kolkata. The team at CARNATION comprises of well experienced metallurgists and engineers to understand and cater to customer requirements. 2. DT-7 (mould masters make) equivalent to ARPA-900-Jolt Squeeze Machine. 3. DT-3 (mould master make) equivalent to ARPA-450.-Jolt Squeeze Machine. 72” SWING table type shot blasting machine (double door) with the capacity of 4 Mt/hour. 2WA Y Hanger type shot blasting machine (single door) with the capacity of 4 Mt/ hour. Inductotherm make 750 KW Dual track medium frequency furnace with two crucibles having melting capacity of 1.5 Mt/hour. Inductotherm make 750KW Mono Track medium frequency furnaces with ONE crucibles having melting capacity of 1.5 Mt/hour. Intensive Mixers (500 kgs/batch) 2 Nos- Wesman & Beilon – Romagnoli Make. Plant (2 Mt/hour) 1 No.- Wesman make. Sand analysis for VM, LOI, TC, AC etc. Compact accurate analytic bench type Spectrometer – Meta vision 108 models – Metal Power make. Wet Lab for analysis of Ferro alloys.